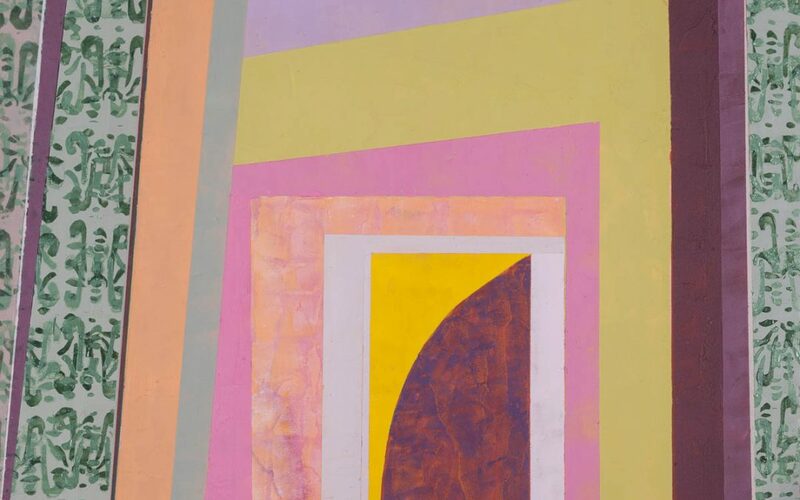 I’m guessing lots of people have never given a second thought to what happens after a painting has been finished, both to the artist and to the painting. For me, finishing a painting is like finishing a book. If I’m happy with it—I have to set it aside and move on. Sometimes this is hard to bear. For this reason I always strive to have a number of paintings in progress all the time, and at different stages. That way it’s easier to motor on without delay. Lots of paintings in progress in my studio. 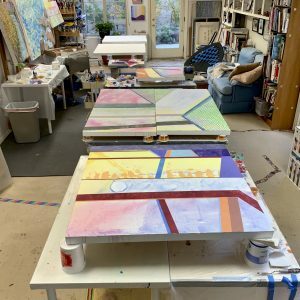 Foreground, a 36″x36″, next a 4-panel 48″x48″, then a 24″x24″ and by the windows, 2-36″x36″ panels. As far as the painting itself, the work is just starting. First, my photographer husband is enlisted to take pictures of the painting(s). I never, ever take this for granted. It takes a really good photographer to capture a painting and to work with the image so that it translates well online. Second, it’s an expensive undertaking unless you’re married to the photographer. Third, I think the way in which Jim lovingly takes the photos of my paintings shines through. Once the paintings are copied, there are a series of steps to be taken in order to document the work and get it out into the public. Today, Jim has nine paintings to photograph, which means all these steps need to be taken 8 times! 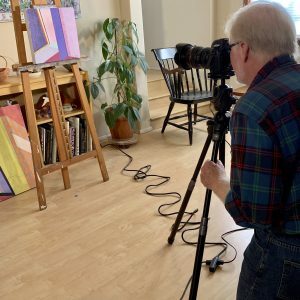 And Jim has a series of steps in his office, adjusting color and sizing each painting for my future use in grant applications, show entries and more. I enter each painting into my Tap Forms data base, including the image of the painting, size, price, date of completion, description. This is an invaluable resource and record of my work. Next, I add the new paintings to my website gallery. This usually includes deciding which older paintings to retire from the website and reorganizing the sequence so there’s a nice visual flow. After this, each painting goes into the 3-online resources I use for marketing and sales—Saatchi Gallery, Nine Dot Gallery, Curator Engine. After this I send an email to a list of arts services companies or them to add to my files. Then I do my 5-day a week Instagram and Facebook posts with one new painting per day as the subject. All of this is time consuming yet necessary. I’m grateful to photographer husband Jim for getting me started in thoroughly documenting my work years ago. It would be impossible to go back in time 30 years to do this, especially since quite a bit of the work is sold. Which brings me to adding information to my data base when a painting sells—where, to whom, their address and other information.